Little things like location of bins and signage can make a big difference. “You can get information to people about curbside recycling, for instance, which they tend to retain. The process rarely changes, so they know what to do from day to day. But with public spaces, it’s hard to get information out. Plus, there is often no uniformity from one place to another,” says Alec Cooley, director of recycling programs at Keep America Beautiful (KAB). The key to ensuring success of “public space” programs is keeping the message brief, simple and clear—and making recycling convenient. Distinctive bins with icons and simple wording to communicate what goes in which bin, as well as putting trash and recycling bins side by side, help to boost participation and reduce contamination. These practices may sound like common sense, but not all regions are doing these things. In fact, some are making counterproductive decisions, says Cooley. One common mistake: often when program planners set up in public spaces, their decisions about bin type and location are driven by aesthetics or other issues rather than functionality. “Recycling may be on one side of a walkway and trash on the other side because it looks better. And some public parks are using high-end bins with architectural flair, but you can’t tell the difference between those for recycling and those for trash. The wording may be there, but it’s small,” says Cooley. Bins should be color-coded and placed where facilitators want people to participate, with signs above them to flag peoples’ attention as they are approaching. One city mastering recycling in public places is Tuscaloosa, Ala., which has a robust program that targets the Tuscaloosa River Walk. Home to many community activities, eateries and small shops and adjacent to an outdoor amphitheater, it receives thousands of visitors daily. “There’s a popular theory called ‘twin the bin,’ and it worked. Placing recycling bins next to garbage containers forces everyone to make a decision,” says Ashley Chambers, environmental educator for the city of Tuscaloosa and executive director of Keep Tuscaloosa Beautiful. Since placing bins out in 2015, the city has collected an average 23 tons of recyclables each year and saved thousands of dollars in disposal fees. The city numbered the bins to be able to easily identify those that may need to be serviced or moved. “Placing recycling bins out allowed us to see that some of the existing garbage receptacles were too close together and barely used. By being intentional about our bin placement, we were able to reduce the clutter of too many containers and place bins further down the walk where they were needed,” says Chambers. Downtown Des Moines, Iowa, has a heavy recycling push in Western Gateway Park and the Historic East Village. It began with a pilot that has since evolved into a full program. Western Gateway has a sculpture park and many year-round events, drawing locals and visitors. The Historic East Village features historic buildings, boutique shopping and a lot of restaurants, so it also sees a lot of foot traffic. 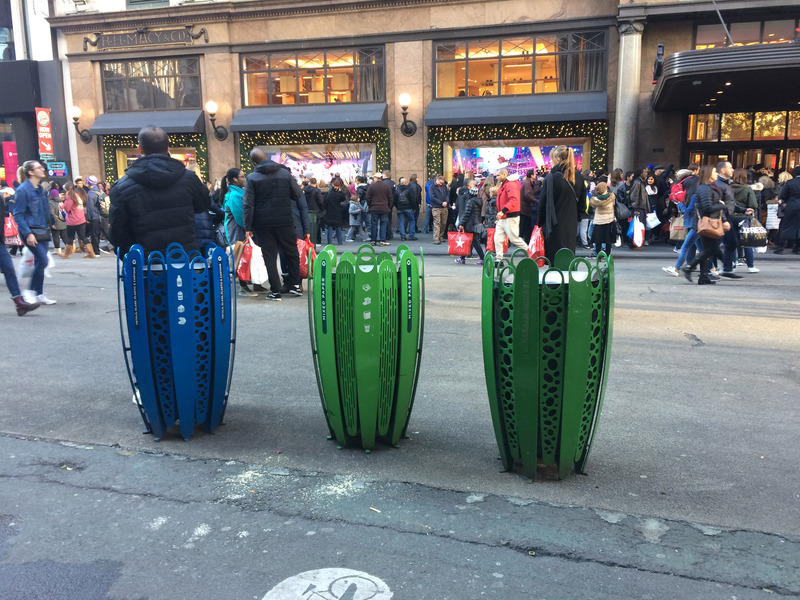 The project entailed partnerships between Operation Downtown and the city, which assisted with the purchase and placement of recycling receptacles and arranged to haul the materials. Iowa Waste Exchange conducted audits and offered suggestions to improve the recycling process, and a Coca-Cola/Keep America Beautiful recycling bin grant was also put to use. During the pilot and since, the Iowa Waste Exchange found that 82 to 87 percent of materials collected between both locations were recyclable. Among changes over time that have made a difference are leveraging an educational campaign and altering signage to address coffee cups that people were tossing in recycling bins. Another change that helped was switching from collecting in bags to using receptacle liners. Currently, there is limited data on waste generation and composition to inform on how to set up programs and evaluate their performance, says Cooley. So, KAB is addressing the issues in a study to come out this spring to help facility planners anticipate needed infrastructure and to benchmark their programs’ performance. For now, KAB offers several online resources for public space recycling. “We hope to reinforce the expectation that recycling is something you do daily, wherever you are,” says Cooley.